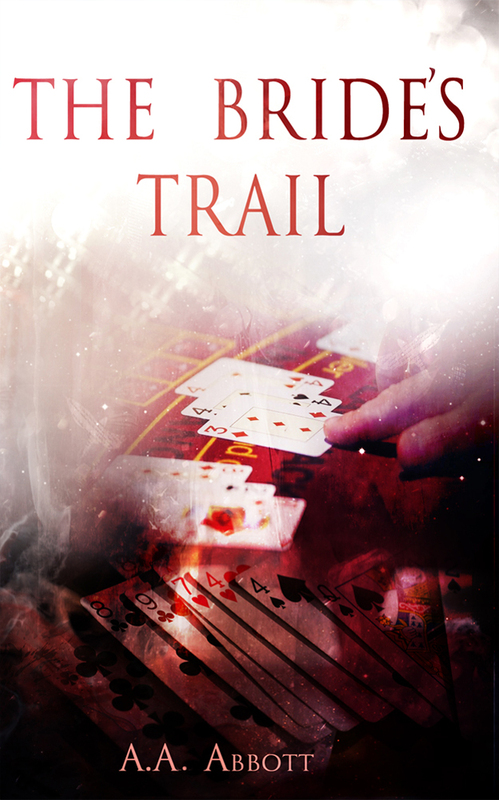 AA Abbott’s Crime Thriller, The Vodka Trail is one of my current reads and I’ll be posting a review of it very soon. 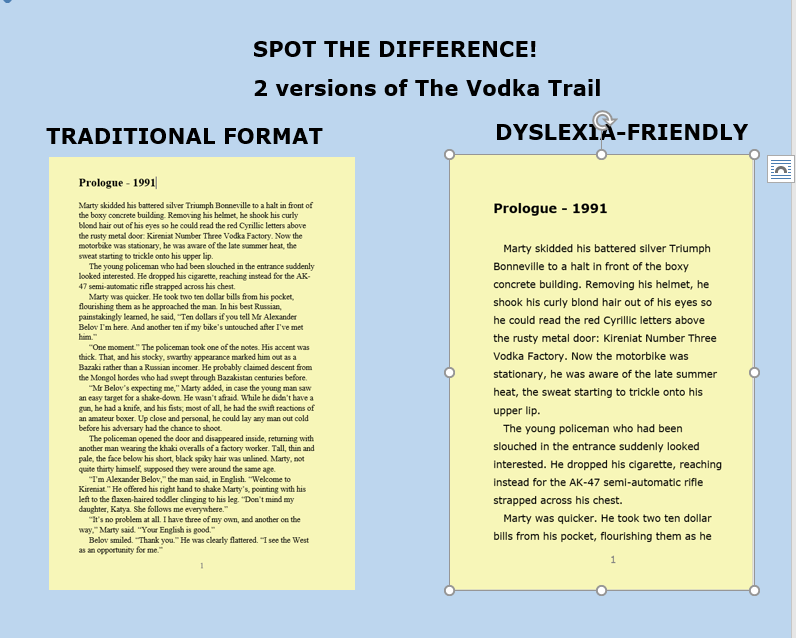 I’m THRILLED that the author has taken time out to write a post about how she went about producing a dyslexia-friendly version of the book and the previous one in the series, The Bride’s Trail. I write fun, fast thrillers that are easy to read. While I devoured the classics at school, I’ve always loved a rattling good yarn best of all. That’s what I set out to write. My style owes a lot to the old Harold Robbins blockbusters, as well as more modern writers like John Grisham and Kate Atkinson. Read The Gap, the “5 minute crime thriller” on my website to get a feel for my work. It isn’t rocket science to produce a dyslexia-friendly book. 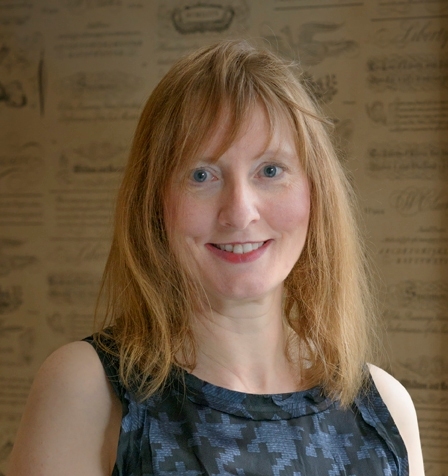 With guidance from Alistair Sims – himself dyslexic, and the owner of a bookshop in the gracious seaside town of Clevedon – I followed the BDA guidelines. My new editions are printed in a large sans serif font, on cream paper (easier on the eye than bright white). They’re listed on Amazon (just click on either The Bride’s Trail or The Vodka Trail to find them) and available to bookshops (who can order them from their wholesalers if they’re not in stock). 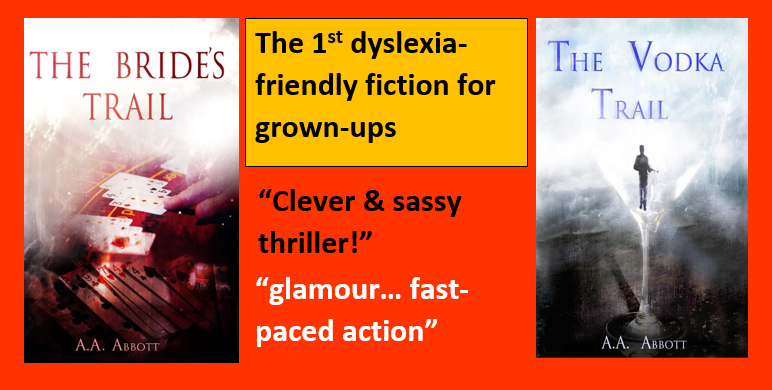 So far, the response has been positive, with dyslexic readers telling me that the new books are very quick to read and don’t stress them out like more conventional paperbacks. I’m also planning to record audio-books to make my crime thrillers even more accessible. They’re already available as e-books and traditional paperbacks, of course. So what are the books about? The Bride’s Trail follows the fortunes of Amy, who’s just graduated and is struggling in a dead-end job, fed up with her non-existent love life and jealous of Kat, her glamorous flatmate. Everything changes when Kat disappears. It seems she’s been marrying illegal immigrants for money, and if local gangster Shaun can be believed, she’s stolen cash from him too. Amy’s quest to find Kat and warn her about Shaun leads her to the semi-secret tunnels below Birmingham’s old Jewellery Quarter – and a descent into danger. 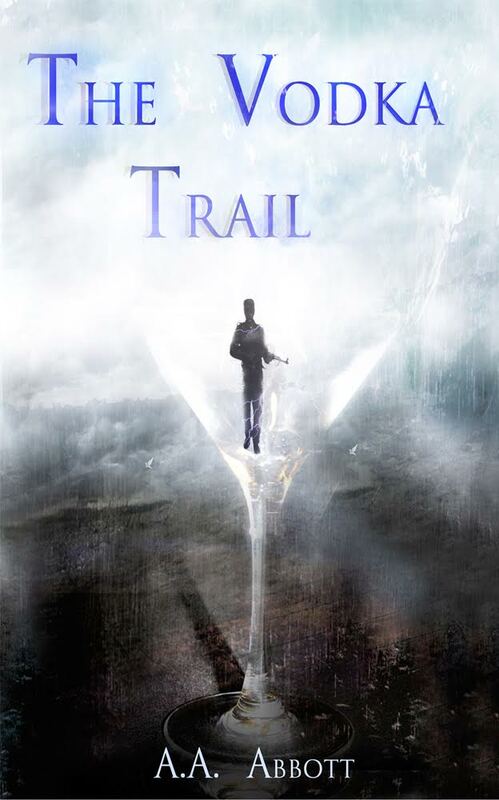 The Vodka Trail moves the action a year on, with Kat trying to recover her family’s vodka business in the former Soviet Union. Naturally, that causes some panic for current owner Harry, and Marty, the swashbuckling Birmingham businessman who distributes the premium vodka across the globe. Despite Kat and Marty’s distaste for each other, they must co-operate to survive when they’re both kidnapped by terrorists. Both thrillers are a pacy, quick read (as are my earlier standalone books, Up In Smoke and After The Interview). I’m currently writing The Grass Trail, which focuses on villainous Shaun’s continuing obsession with Kat. This will be out in Summer 2017, and you can receive updates (and a free e-book of short stories) by subscribing for my newsletter at http://aaabbott.co.uk. I’m also on Twitter as @AAAbbottStories and on Facebook`, so feel free to connect with me there too.